NovaBirds Cam Blog: An Exciting Visitor! 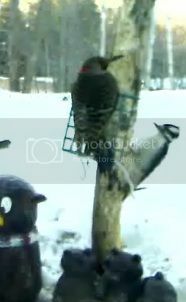 Male Northern Flicker at the seed feeder. It's amazing how unpredictable birds can be. 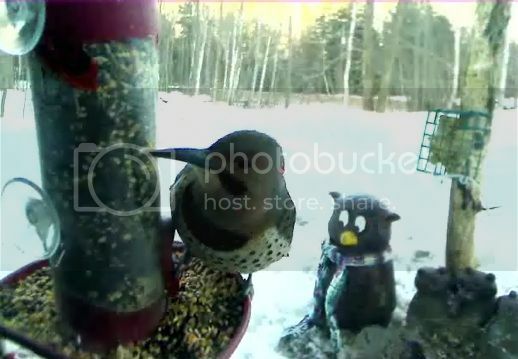 This morning I got a surprise when I opened the cam at work to see a curious Northern Flicker investigating the seed feeder! We have lots of Northern Flickers around our property during the summer months. They're commonly poking around the yard, looking for insects under the lawn. In the winter however, they're less common...and even less common than that is to see one on a seed feeder. Typically if they visit a feeder, they'll go for suet, as most woodpeckers do. This guy must have been pretty hungry! I didn't see him sample any of the seed, but he looked like he was seriously considering it. He flew off shortly after, and I figured it was just a fluke that he stopped by. Luckily a while later he appeared again, this time bickering with a hairy woodpecker over the suet basket. Maybe we'll be able to keep him interested in our feeders and he'll become a regular visitor! If any of you spot him while viewing the cam, feel free to send a snapshot to nova.birdcam@gmail.com and I'll add it to the gallery! To take a picture, simply press the "Print Screen (PrtScn) button on your keyboard and then Paste (Ctrl +V) into a program such a paint. Stay tuned! Hopefully this fellow will become a regular!